Calendar Year (CY) 2017, so far has been another lacklustre year for the investors in gold worldwide, including India. In US dollar (US$) terms, gold has advanced merely 6.8%, while in Indian rupee (INR) terms, even moderate –––to the tune of 2.2%. Geopolitical tensions between the US and North Korea: The war of words and some feeler action from North Korea (firing test bombs and missiles into the Pacific Ocean) brought in geopolitical uncertainty. This worked in support of the precious yellow, which otherwise did not exhibit much sheen. In fact, had this factor been absent, the precious yellow metal would have fared worse amid a period of risk-on. Strong performance of equities: In an attempt to generate better real rate of return adjusted for inflation, investors flocked to equity as an asset class supported by upbeat sentiments and fundamentals. The S&P 500––––one the world’s widely tracked U.S. equity index–––––rose nearly 19% in 2017 so far. Moreover, all major markets in the Europe and Asia generated appealing returns, which made gold look not so attractive from an investment standpoint. Hawkish monetary policies The monetary policy in the US evolved on the pre-established path of normalisation taking cognisance of signs of economic vigour (GDP growth data, job data, business confidence, etc.) and inflation moving up, had the Federal Reserve (Fed) hiking interest rates thrice in 2017, 25 basis points (bps) each time (a total 75 bps increase in 2017). But accommodative stance maintained by the European Central Bank (ECB), Bank of Japan (BoJ), to name a few was an abetting factor. How will 2018 look like for gold? In the coming year, central banks in the developed economies are likely to further withdraw monetary policy support, and thus interest rates may move northwards. As per various estimates, Fed is likely to increase interest rates 3-4 times in 2018. Rising energy prices, medical costs and rents are expected to push the inflation higher in the world’s largest economy–––the US. Excess liquidity in the global financial system may witness a retreat owing to some of the biggest central banks of the World. ECB and BoJ may lower their support to the respective economies, thereby aligning their policy stance with that of Fed. As a result, gold prices may continue to remain under pressure. Coming to geopolitical tension, which has been main driver for gold to exhibit sheen; the U.S. has shown its willingness to reach out to North Korea for diplomatic resolutions. However, it expects the latter to first create conducive environment for talks to be fruitful. If the US manages to get China on its sides and further isolate North Korea, the warmongering situation may ease out. China and Russia may never want a strong presence of the U.S. on the Korean Peninsula and thus may play a role of interlocutors in the US-North-Korea negotiations. If the geopolitical situation goes worse than thought, then gold is likely to find support from smart investor who shall approach it as a safe have, a store of value during uncertainty. But a strong greenback may hold back from going aggressive. If 2017 marks the end of a multi-year period of US dollar strength, then gold could benefit from that tailwind. What Indian investors should expect? Demonetisation and GST are believed to have affected the gold demand in India negatively. Even during festivals, the demand was relatively weak. As Indian equity equities by and large have generated over 25% returns in 2017, the precious yellow metal has not caught much attention of investors. Sagging gold imports suggest that, even at lower prices, incremental buying has not seen traction. 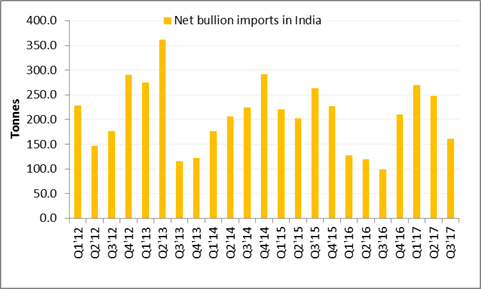 It is estimated that in the last quarter of Q4’17, India’s gold imports possibly will fall; but wedding purchases in the last leg of the quarter still remains a hope as regard gold demand. As you may be aware, India’s fiscal deficit touched 96% of the full year target in the first-seven months of the current fiscal year. India’s current account deficit (CAD) too has widened yet again on rising imports: In September quarter CAD it doubled to 1.2% of GDP or US$ 7.2 billion. Rising crude oil prices in the global markets has caused the oil import bill to balloon. During such times, the Government is likely to discourage higher gold imports as it could worsen the deficit situation. In PersonalFN’s view, Gold may remain lacklustre in 2018 as well. Nevertheless, considering the following factors in play, continue to invest in gold at regular intervals. So, be a smart investor, continue to take refuge under gold. During such times gold would exhibit its trait of being a safe haven. Remember, the precious yellow metal as an asset class is an effective portfolio diversifier and a hedge. The long-term secular uptrend exhibited by gold, is something that invites attention and highlights the importance of owning gold in one’s portfolio with a longer investment horizon. 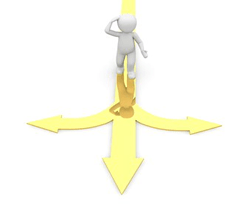 On the backdrop of the above, PersonalFN recommends allocating at least 10% of your entire portfolio to gold and holding it with a long term investment horizon, will be a prudent strategy. But buy gold the smart way, via: gold ETFs, gold saving funds, sovereign gold bonds, and/or e-gold. Remember, buying the yellow metal in paper form has many advantages that are missed when you buy gold in a physical form.